The horseshoe-shaped Forum Theatre is perfect for performances of all kind, including plays, musicals, concerts, dance, readings, and even parties and receptions. The theatre is well-equipped with fixed circuits throughout the ceiling grid, allowing you to install a light or electric fixture anywhere in the air above the stage and seating areas. A generous inventory of over 40 lighting instruments and computerized light board allow you to make your lighting design dreams a reality. The sound package includes a professional double CD deck, Yamaha mixer, 2 power amps and graphic equalizers, and 2 bi-amped speakers, and a 6-channel snake. Of course it is flexible enough to augment with any of your own components. 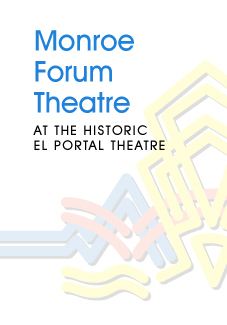 The Forum is an outstanding showcase for extended engagements of theatrical plays and musicals. In the past it has been home to critically acclaimed productions of I Capture the Castle, A Yankee Trader, Fellowship, 10,000 Years, The Last Five Years, and the longest running musical The Marvelous Wonderettes. The Marvelous Wonderfettes opened off Broadway in Fall 2008.